We are proud to announce two new acquisitions to our Permanent Collection – Cups for Argamenon’s Mask, 1995, by Brazilian conceptual artist, Tunga (Antônio José de Barros Carvahlo de Mello Mourão) and a watercolor drawing, A Plan for a Summer House/ Plano de casa de verano, 2002, by the Cuban collective Los Carpinteros (Marco Castillo, Dagoberto Rodríguez and Alexandre Arrechea). Formed in 1991, Los Carpinteros’ work is the result of the hybridization between the functionality of architecture and everyday objects with a humorous twist. 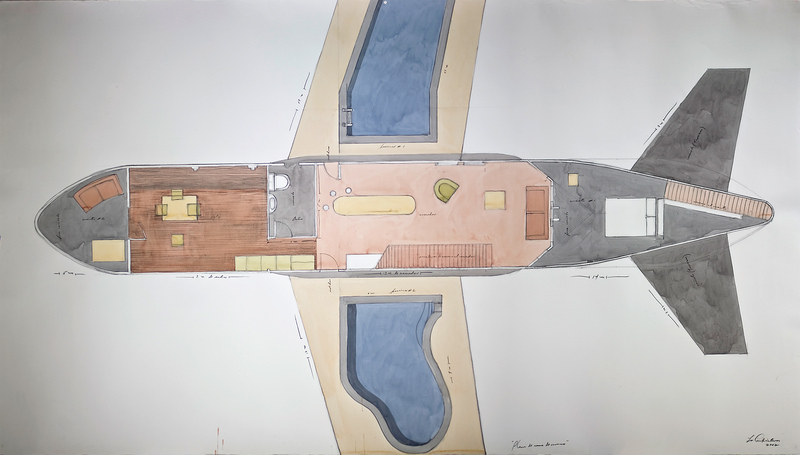 In A Plan for a Summer House, Los Carpinteros propose an imaginary space – a blueprint or floor plan in the shape of an airplane – of a house whose functionality is only symbolic since the actual realization of this design seems impractical in the real world. The artists’ sculptures, installations and drawings convey a sociopolitical commentary on commodities and the realm of the domestic. 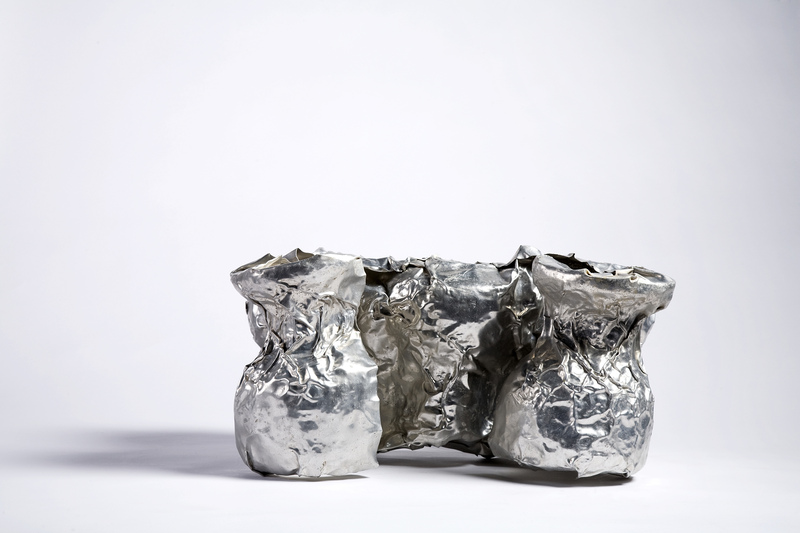 Tunga’s Cups for Argamenon’s Mask is an example of the artist’s esoteric universe of objects and installations in which he rewrites – or creates new myths by combining reality with poetry, using symbolic materials, literary references, spiritual elements and iconographic imagery. A non-literal reference to the Mycenaean funeral gold Mask of Agamemnon (1550 BCE – 1500 BCE), this sculpture possesses the sacred quality of an archaeological relic or a holy chalice that. However, it is an austere and strange object that somehow manages to appear familiar to us. Such allegorical forms, bells, chalices, urns and metallic materials like iron, copper, gold and lead are recurrent in Tunga’s art.